Junior Biological Society arranged a study tour to Auriga Chemical Industry on 15 November 2016 in order to enlighten the students of the working and mechanisms involved in manufacturing, as well as, to make them aware of important future horizons. Students were provided transportation facilities by the college administration. The trip was accompanied by Advisor JBS, Mr Umar Bhatti and Co-advisor JBS, Mr Arooj Justin. 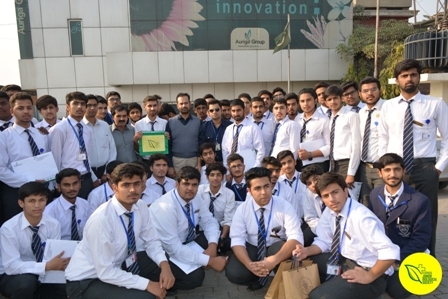 The students were warmly welcomed by Malik Muhammad Ali, Admin Manager of Auriga Chemical Enterprises, when they reached there. 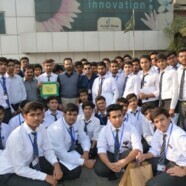 A formal meeting was conducted between students and the head Microbiologist, Dr Irfan where students were informed of the machineries and techniques being used in the industry. Students were given deep insight of all processes taking place over there. Students were given refreshments on their way back, followed by a formal photo session held while departing the industry. JBS also presented Souvenirs to the respective hosts.